Kyle Nicol (from Lumpini Crawley) Vs. Steven Jones from Manchester. Both have pretty decorated fight records and Jones is noted by the promoter to be known for being a heavy puncher. Paul Bates Vs. Josh Turbill. Josh Turbill fought and won a closely contested fight with Mike Egan and Paul Bates has been a veteran of Muay Thai nearing 2 decades now. Ben Barwise Vs. Daitan Jackson. This is basically billed as a revenge match for both fighters who also met at Rumble at the Reebok II in May with apparently neither being pleased with the split decision. Getting into the heavier boxers this match will be at 88 kg. This is a clash of the Welterweights. Liam is a Golden Belt Champion. Liam very recently completed competing at the 8-man Champions Trophy event and acquitted himself very well. Lee is the son of 5 x World Champion Master Ronnie Green and has won IKF and AKA World Titles. Lucy trains out of the world renowed Touchgloves Gym under 11 x World Champion Julie Kitchen. Lucy was recently crowned ‘Queen of the Ring’ at Ringmasters 2010. Cassie has been advancing in Muay thai champion and has won the UKMF title. Rob is coming off a win at Rumble at the Reebok II against Mason Harris. Peters recently won an IKF Title. 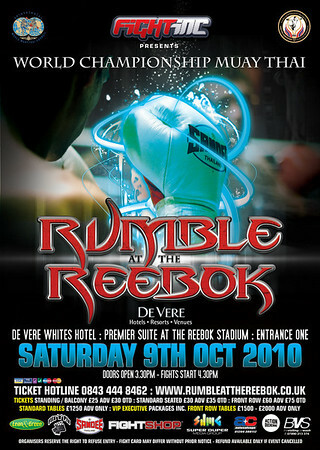 The official trailer is below and the team behind Rumble at the Reebok has even taken it upon themselves to do some interviews with some of the participating competitors.